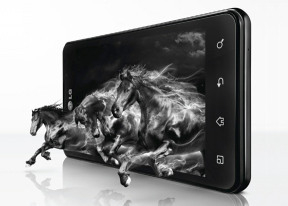 With this new generation, LG have improved upon the design of the Optimus 3D by adding a textured back panel to go with the thinner profile. The 3D Max has a more uniform front composed from top to bottom with Gorilla Glass 2, and the back panel now has a pleasant texture, instead of the rubbery plastic composite found previously. The back still has a slight protrusion, but instead of it being around the camera lenses, it is at the bottom, where the antenna lies. The slight problems we had when handling the original Optimus 3D due to its thickness are solved on the 3D Max. It is no longer hard to wrap your hand around the entire device and still be able to reach all areas of the screen with your thumb. Just above the display lies the front-facing camera, in between the proximity sensor and earpiece. The four-capacitive-key layout from the original remains the same; the Menu, Home, Back and Search keys are haptic enabled and light up when pressed. They are not as brilliantly backlit as before, but they do have the usual Android functionality. Gone are the faux brushed-aluminum plastic sections at the top and bottom of the device - along the front it's all glass. The left-hand side of the LG Optimus 3D Max has the microUSB port at the bottom, and the volume rocker has been moved from the right side to the left, and has buttons, which are a bit more defined and thus easier to press. The microUSB port also has a neat cover, which slides away to reveal the port itself. This left side reflects one of the few noticeable detriments of the Max compared to the original Optimus 3D, which is the lack of a dedicated microHDMI port. Perhaps this is one of the sacrifices LG had to make to achieve a 9.6mm waistline, or they simply decided to make HDMI connectivity only available through an MHL adapter (not included), either way, it's gone. The dedicated 3D key is on the opposite side of the smartphone, in the spot usually reserved for a camera shutter key. As such, it can be used as a dedicated camera button, but also performs various 3D-related tasks across the UI, such as switching between 2D and 3D mode when viewing 3D videos. We cover all of the functions of the 3D hotkey in our software overview on the next page. The same textured plastic found on the back panel also adorns the top of the 3D Max, where you can find the power/lock key and the 3.5mm audio jack. The power key has seen the same makeover as the volume rocker and 3D key: all protrude slightly and are much easier to press than on the Optimus 3D. It seems LG really put some effort into improving the handling of the 3D Max, at least where these hardware keys are concerned. The bottom of the device is bare save for a microphone pinhole. Finally, we turn the LG Optimus 3D Max around to meet the dual 5 megapixel camera lens combo with a tiny LED flash squeezed in between. The loudspeaker grille is on the back, as well. The SIM card slot and microSD slot are located under the battery cover. The microSD allows you to expand the Optimus 3D Max storage by up to 32 GB, and is hot-swappable to boot. Unfortunately, the convenience of having a hot-swappable microSD card is slightly diminished by having to open up the battery cover every time, but it's a feature nonetheless. The general build quality of the Optimus 3D Max is pretty good. The move away from a rubberized plastic back coupled with a slimmer profile make the 3D Max feel less bulky but still pretty durable. While some things were lost along the way (like the dedicated HDMI port and secondary microphone), the retouched physical buttons, textured plastic panels and especially the reduced thickness make the redesign feel like a definite improvement from the original. It seems that minimization was key for LG in this iteration of the Optimus 3D line, and we particularly liked how the wall-to-wall glass along the front added to this illusion. Coming up is our examination of the 3D user interface of the LG Optimus 3D Max.